Treating oncology patients in the Baltimore community is rewarding work for GBMC's Chairman of the Department of Radiation Oncology, Dr. Rob Brookland. But he didn't want his impact to end there. 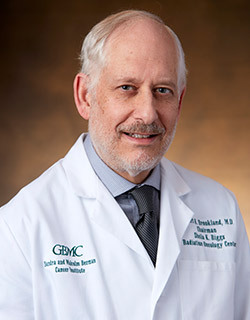 Since 2013, Dr. Brookland has been the Vice Chair of the American Joint Committee on Cancer, an organization that, among other things, organizes and publishes the rules for staging in the United States in a text called, AJCC Cancer Staging Manual. The 8th edition, of which Dr. Brookland was an editor, was released late last year. Every oncologist in the country uses the 83 chapters of this manual to effectively and accurately stage cancers. "Staging is the language for cancers," Dr. Brookland said. "It's how doctors communicate with one another, so we can be talking about the same thing and have a language for expressing how advanced different cancers are. Staging is very important in order to determine what the appropriate treatment is for all these different cancers." In addition to establishing a common language among physicians, the thousand-page textbook is used by reporting bodies, such as the state's registrar's office, for the tracking and reporting of cancer data. "It's important to know how much cancers of a particular type there are in the state or the country," Dr. Brookland said. "Are those numbers going up or down? Are patients with Stage 1 disease in Maryland doing better or worse than anyone else in the country? Are those people just more advanced? Is there something we can be doing to find these cancers earlier? There's a lot of value in appropriate staging – communicating, making decisions about how to treat people, following up to assess how you're doing and then the population surveillance. It's all very important. You can't do any of that stuff if you don't have a common language." Much has changed in the 40 years between the first edition and the current one. The text is updated roughly every 5-7 years depending on the necessity of editing the stages. 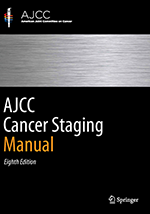 This edition, for instance, added "12 entirely new staging systems, a wide range of changed or new staging definitions, and a refined emphasis on a personalized-medicine approach," according to the AJCC. For Dr. Brookland, being a part of the production process is as much about contributing to the practical execution and evolution of his practice as it is the humanitarian side. "It's important for physicians to contribute to the community," Dr. Brookland said. "In addition to caring for our patients, I think we have some special strengths, special responsibilities, to contribute in various ways to the greater community. Treating patients here is wonderful and very fulfilling, but I'm working on an individual level. This kind of work really allows a focus more for a larger community, in this case, the entire American community." 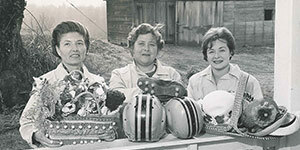 The Nearly New Sale has been a tradition long before GBMC existed. The first sale, led by the women's committee from the Hospital for the Women of Maryland of Baltimore City, took place in 1955, and today, the warehouse on Farmhouse Hill famous for the sale is need of some TLC.